If you are in Phoenix, Scottsdale, or any of the surrounding cities on December 31, 2018, there are plenty of ways to celebrate New Year's Eve. On top of just about every resort in the Valley of the Sun having a New Year's Eve dinner with some bubbly and a midnight kiss, or enjoying a restaurant for New Year's Eve dinner, you can also consider some of these events if you're looking for a night of dancing and Champagne, family-friendly events, and alternative ways to ring in the New Year. Reservations or tickets may be required. The Phoenix Symphony New Year’s Eve concert is always popular. Beginning at 7 p.m., enjoy famous Strauss waltzes, seasonal favorites, and Broadway tunes. A complimentary glass of Champagne will top off the two-hour concert. For New Year's Eve 2018, you can celebrate at the Raven's New Year's Eve Gala held at Talking Stick Resort's 2-level showroom. They'll have a high-energy party band, Bounce, performing old classics and current favorites including pop, funk, hip-hop, and Top 40 dance music. DJ Mr. Pink will be playing even more dance music as the evening progresses. Champagne toast at midnight, party favors, and a balloon drop over the dance floor round out the offerings. Tickets are $60 per person. Wear your flapper finery and ring in 2019 at the historic Royal Palms Resort at the base of Camelback Mountain. The resort was built in the 1920s and is the inspiration for the Roaring 20s NYE party. Entry includes two drinks, dancing to live and DJ music, a seafood raw bar, tapas, and dessert bar. There will be a Champagne toast at midnight and a three-minute fireworks show. Tickets are $150. Join the retro-style party at ZuZu at Hotel Valley Ho in Scottsdale. They will be serving a special Prix Fixe dinner from 5:30 to 10:30 p.m. Choose from two seating options. The first seating is from 5:30 p.m. to 7 p.m. and costs $125 per person. The second seating is priced at $160 per person and runs from 8:00 to 10:30 p.m. and offers Champagne pairings. On New Year's Eve 2018, end the year with the Phoenix Symphony's New Year's Eve Gala at the Arizona Biltmore. Enjoy a cocktail reception, dancing, and a three-course dinner. The exciting part of this event is that you can dance your way into 2019 to the music of the full Phoenix Symphony Orchestra. A Champagne toast and special deserts add to the festivities. Tickets for this fundraiser are $500 each. At The Sanctuary on Camelback Mountain, enjoy a sophisticated dinner party at Elements or party the night away with music and dancing at Jade Bar to ring in 2019. Jade Bar's party begins at 8 p.m. and runs until 1 a.m. and features DJ music and dancing. Packages include dinner and a bottle of Dom Perignon. Elements offers a four-course menu by Chef MacMillan, with two seating times. The first seating is from 5:30 to 7 p.m. and costs $150 per person. The second seating includes a complimentary Champagne toast, plus entry to the party at Jade bar and is from 8 to 10:30 p.m. This seating is priced at $195 per person. Take a twinkling lights tour or a historic tour starting in Old Town Scottsdale via golf cart. Have fun on this 90-minute narrated tour tooling around downtown Scottsdale. Have an early New Year's Eve and take a Joy Rides tour running between 4 p.m. and 9 p.m. This cost is $65 per person. It's a New Years Eve Masquerade Party so dress up and wear a fancy mask. It's required. You may even win a prize for your mask. Tickets include the first drink, party favors, and a midnight toast. Tickets are priced starting at $50. The party kicks off at 9 p.m. and is located at The Hidden Place at 15005 N. Cave Creek Road in Phoenix. You'll be dancing to the music of Motown, classic rock and roll, and soul as you bid farewell to 2018. If you were born between 1946 and 1964 you are a Baby Boomer and you'll remember these tunes. The party happens at the Hilton Scottsdale Resort. Cost is $99 per person and includes a buffet dinner, midnight Champagne toast, favors, and a cash raffle drawing at 11:45 p.m.
Head for central Phoenix for New Year's Eve in the Roosevelt Row Arts District. Ring in the New Year at the 2019 Flannel Ball. No formal attire here. You'll find beer, live music, food trucks, lawn games, and a photo booth. At midnight there will be a Champagne toast and piñata drop. Tickets run $15 to $25. All ages can join in. The event will be held at the Roosevelt Growhouse at 1025 N 2nd Street. From 9 a.m. to noon on December 31, the Phoenix Zoo presents the "coolest" way to celebrate the New Year: "Noon Year's Eve." Festivities include tons of snow (with a special snow area just for toddlers), dancing, bounce houses, music, games, and prizes, all of which are included with regular Zoo admission. Taking place at the Camelback Ranch-Glendale from December 28, 2018, through January 3, 2019, the annual "Across the Years" Footraces challenge visitors to 72, 48, and 24-hour footraces. Drawing runners and fans from across the United States, the go-as-you-please events are popular with beginners and competitive runners, allowing them to run, socialize, eat, rest, and sleep as desired to close out 2018 and start off 2019 in a healthy way. Each year, the Rawhide Event Center in Chandler hosts an annual New Year's Eve bash called "Decadence Arizona" on December 30 and 31. It's a two-day festival that encourages guests to embrace self-indulgence and extravagant excess as they lower their inhibitions to live lavishly and let loose. A variety of musical performers in the electronic music scene perform on several stages around the event—check the website for the full lineup for 2018 - 2019. Topgolf at Gilbert and Scottsdale will both host New Year's Eve events where you and six or fewer friends can swing in the new year. All packages include unlimited golf from 9 p.m. to 1 a.m., a fantastic fireworks show, and party favors. There will be live entertainment, a gourmet dinner menu, and a fun midnight celebration to ring in 2019. You can sign up for their VIP Experience for an all-inclusive dinner with carving stations and a bottle of bubbly. Westgate Entertainment District in Glendale will have a lot going on for New Year's Eve. If you want to ring in 2019 with a few laughs, head for the Stir Crazy Comedy Club for an evening with comedian Tim Gaither. Shows are at 7 p.m. and 9:30 p.m.
Tim Gaither has performed all over the United States and has entertained US troops in Canada and Korea. Mesa Golfland is a fun place for the whole family to ring in 2019. You pay once for all the fun attractions—video games, race cars, laser tag, mini golf and more. Tickets are $21.95 online or $26.85 at the door. You are encouraged to wear gold at The Gold Affair NYE Gala. 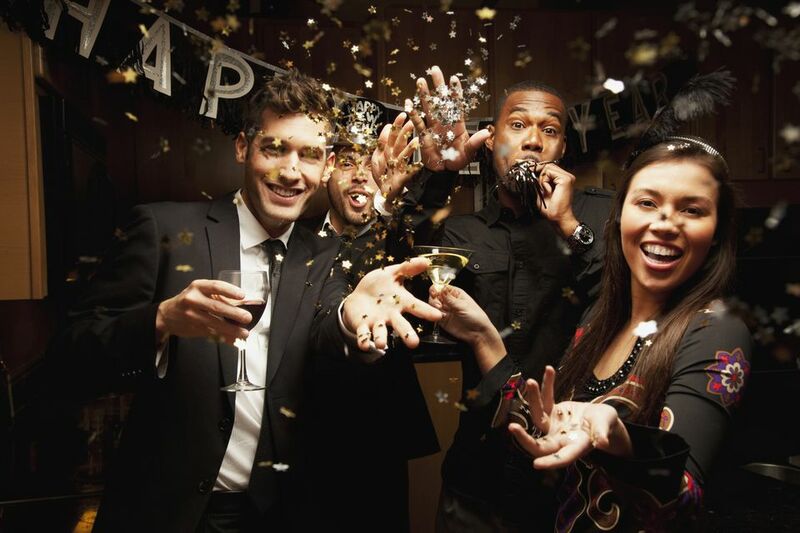 This fun event is billed as the "sexiest New Year's Eve Party in the Valley." Tickets start at $15 and go up to $200 for a top VIP package ticket. There will be DJ's, VIP areas, favors, a Champagne toast at midnight and more. Dance the night away in two party rooms. The festivities take place at the Monarch Theatre at 122 East Washington Street in Phoenix. Head to The Rhythm Room for an evening with Cold Shott and The Hurricane Horns bringing you R&B, blues, Funk and Soul music. The band, which started in Phoenix, is an 8-piece group with a rhythm section, vocals, and a 3-piece horn section. You'll dance your way into 2019 with this type of music. The Rhythm Room is located at 1019 E. Indian School Road in Phoenix. Tickets are $8.00. Doors open at 8 p.m. and the show starts at 9 p.m. The new Keeler’s Steakhouse in Carefree is hosting a New Year’s Eve Gala Event. Enjoy a buffet dinner which includes carving stations, seafood, dessert, and drinks. After three drinks (included with your ticket), there is a cash bar and then at midnight, a Champagne toast. Dance your way into 2019 with a live band. Tickets are $100. Keeler's is located at 7212 E Ho Hum Drive in Carefree. It's a family-friendly evening at Dave and Buster's. Package prices run from $35.21 to $43.21. Depending on the package level, you'll enjoy family-friendly buffet dining, access to the great games, lots of soft drinks and, at midnight, a video ball drop. You'll find Dave and Buster's at 2000 East Rio Salado Parkway in Tempe.